He began his Spanish dance and flamenco training with Antonio Mondéjar. 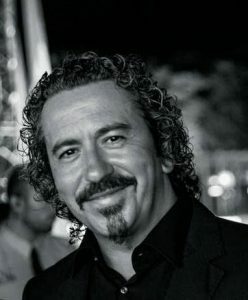 At the age of thirteen, he moved to Seville to start his career with Mario Maya’s ensemble, with whom he participated in the show “El amor brujo”. In 1988 he became a part of Yoko Komatsubara’s ballet in the show “Yo elegí el flamenco”, that premiered at the Teatro Español in Madrid, and of Rafael Aguilar’s ballet choreographing “Bolero de Ravel”. He took part in the film “Montoyas y Tarantos” del director Vicente Escrivá. In 1989 he worked with Cristina Hoyos’ ballet in her first show “Sueños flamencos”, presented at the Paris Festival. That same year he began to work with the Ballet Nacional de España until 1998, where he interpreted almost every solo part, highlighting his role as Jason in “Medea” by José Granero, under Miguel Narros’ direction. At the same time he was participating in “La Gallarda” by Rafael Alberti, at the opening of Expo 92 in Seville. 1998 he was the guest artist in Antonio Canales’ ballet, interpreting the leading roles in the plays “La casa de Bernarda Alba” and “Guernica” directed by Lluis Pascual. In 1999 he choreographed “A fuego lento” with Luis Ortega to celebrate the gala “Día Internacional de la Danza” at the Teatro Albéniz in Madrid. She interprets the role of “Julio Romero de Torres” in the show “Musa Gitana” by Paco Peña’s ballet, that premiered in London. He travelled with Luis Ortega to Japan to choreograph Yoko Komatsubara’s show “Bodas de sangre”. In 2005 he interprets and choreographs, alongside Sara Baras, “Asturias” for the film “Iberia“ by Carlos Saura. In 2007 he participates in the Festival de los Patios de Cordoba with “José Serrano en concierto”. In 2009 he collaborates with Sara Baras in “Pasión” by Luz Casal, in the songs ”Historias de un amor” and “Con mil desengaños”. In 2010, in Cordoba, he presents the show “Re-encuentro”, within the Festival de Los Patios.